Ah, well, if you form an airtight seal you've got the air already in the barrel cushioning your hand, haven't you? 580 MPa? Well, that's less than the 163 GPa I worked out for that 9mm bullet stop. (Only 2 GPa if you allow it 4mm of skin thickness in which to stop). The amount of propellant in the tank round outweighs the air in the barrel, and the propellant gas gets hot, so the shell will go most of the way before the air being compressed in front of it exerts as much pressure on its front as the propellant gas does on its rear, but that'll happen somewhere. I doubt the compression heating would set the shell off, but the pressure between the shell and your fist could get high enough to pop the barrel wide open and wreck the gun ... if you're super-tough and don't get popped out like a champagne cork, of course. After all, guns are only made to hold so much pressure, the pressure decreases as the bullet goes down the barrel (beyond where the powder finishes burning fast enough to keep it up) in normal use and they don't like being obstructed. Of course, water translates impact into outward pressure pretty well. 6.56 MN. PI * (60mm)2 * 580 MPa = 6.56 MN. That's like the weight of 670 metric tonnes. Here's a 670 ton displacement barque called Alexandrina. Could this Blob guy lift that one-handed? Sableagle wrote: Ah, well, if you form an airtight seal you've got the air already in the barrel cushioning your hand, haven't you? That is not a lot of air, and anyways, if it were compressing enough to stop a bullet, it would be exerting equal force upon your finger. Your finger being more fragile than a lead projectile, it is likely that your finger is going to give first. Not sure of the exact math for comic book physics, but a real world finger in a real world gun, your finger will lose. Depending on precise load of round and amount of tolerance in the gun barrel, the added strain *may* damage the gun, but that will not matter much to your hand. This is vastly unlikely, as most guns are made with very high tolerances because, yknow, gun. If your finger/arm deforms to seal well, doesn't leave the barrel or leak air, then the pressure and force will rise towards infinity as the fingertip/hand gets deformed to match the shape of the bullet/shell and the remaining volume of barrel-air drops. An explosive shockwave and crushed finger/limb that would ruin you, are merely laughable flesh wounds in comic physics. (Note that the plugger isn't looking at the explosion, which makes them cool and fine.) Shake off the coal dust and tingles by face-punching more bad guys. In high-energy environments, flesh can be approximated with water. If you block the barrel of a gun with just a few inches of water, there is a good chance of barrel rupture - plenty of empirical evidence for this on youtube. Ergo, an arm/finger in the barrel will certainly get smashed to poop, but the gun may not come out unscathed either. Depends on the weapon of course. Tyndmyr wrote: it is likely that your finger is going to give first. Not necessarily, your finger has mass, so to get it out of the way fast enough it must be accelerated very hard - significantly harder than the bullet has been accelerated. So whilst the forces may be unbalanced and acting to push the finger out of the way, the finger may not accelerate fast enough. Like if I took a door off its hinges and stood it up on the floor, balanced on one of its edges, you could push it over with only a few Newtons of force. But if you sprinted at it as fast as you could and ran straight into it, you would get an awful whack of many Newtons - then the door would fall down. So you might get: insert finger - bullet fired - air in barrel compresses - finger starts to move backwards - bullet continues travelling, pressure continues to rise - barrel ruptures - finger (or finger-mush) exits barrel (or whats left of it). This is a real danger in firearms maintenance - a small piece of fabric wadding left stuck in a barrel can be pushed out with a rod, but stands a very good chance of explosively dismantling the weapon if it is fired in this state. Oh yes, the finger chunks will exit the barrel, that's not the contention. The point is that they'll not stop the bullet. That's the essential bit right there for the future of said finger. I was concentrating on the fate of the weapon but you are right of course. Bullet will already be moving and there only one way to stop it. p1t1o wrote: Like if I took a door off its hinges and stood it up on the floor, balanced on one of its edges, you could push it over with only a few Newtons of force. But if you sprinted at it as fast as you could and ran straight into it, you would get an awful whack of many Newtons - then the door would fall down. What if I paint the door onto a brick wall? Will it work the same as painting a tunnel onto a rock wall? Soupspoon wrote: What if I paint the door onto a brick wall? Will it work the same as painting a tunnel onto a rock wall? These appear to be opposite cases, only one of them will resemble the previous example. It depends on if you paint hinges and on which direction you paint the latch. If a gram of matter were to spontaneously turn into energy, would the effect be noticeably different from a nuclear explosion? I know one gram of mass is equivalent to about 90 TJ or approximately the yield of Fat Man, but in any nuclear explosion we have to consider the bomb itself, which is vaporized. But say a gram of air a few hundred meters above the ground suddenly turned into X-rays and gamma rays. I figure the surrounding air would be superheated and rapidly expand, but since we don't have any solid bomb to vaporize, would the explosion be different from a nuclear bomb of the same yield? I imagine that there might be a less powerful shock wave with a greater portion of the energy shed as thermal radiation. Or would the difference be negligible? A nuclear-driven explosion would produce a large number of high-speed neutrons and protons that would collide with the nuclei of the surrounding air/whatever and cause secondary radioactivity. The matter-conversion explosion, by contrast, would have only high-energy photons. A typical matter-antimatter explosion produces gamma rays and pions I think. You should end up with lots of high energy electrons and neutrinos that haven't annihilated in addition to the gamma radiation. A gram of matter cannot just "turn into energy." Energy is a property of a system, not a thing in itself. It also can't just "turn into X-rays and gamma rays" unless it annihilates antimatter, because lepton and boson numbers are conserved. I figured that. But many What-Ifs deal in impossible scenarios like this. Do we question why a baseball would suddenly accelerate to 0.9c? I'm thinking more along the line of what would happen if you spontaneously released 90 TJ or so of X-rays and gamma rays (or some other EM radiation just for fun) at one location in Earth's atmosphere. You would get a big explosion and maybe some exciting chemistry, but I can't see how you would produce radioactive isotopes. The short answer is - yes, a large amount of energy (no matter the form) dumped into a small volume of air will indeed resemble a nuclear explosion. The exact mechanisms of energy propagation will differ, but the gross end result will be the same - thermal flash, plasma fireball, shockwave and a mushroom cloud. The vast proportion of energy released from the average hydrogen bomb is in the form of X-rays which are rapidly absorbed by air. Now you just have an exceedingly hot mass of air and all further effects result from that. Yes there are some intricacies resulting from neutrons and whatnot, but a ball of air at 10megaKelvins is a ball of of air at 10megaKelvins no matter how you cut it. Eebster the Great wrote: It also can't just "turn into X-rays and gamma rays" unless it annihilates antimatter, because lepton and boson numbers are conserved. What if we make a brief black hole and let it evaporate? We can feed it pure matter, and get the inconvenient values shaved off with all the other hair. Hawking radiation is thermal, so it's still not just photons. p1t1o wrote: The exact mechanisms of energy propagation will differ, but the gross end result will be the same - thermal flash, plasma fireball, shockwave and a mushroom cloud. Little Boy, the nuclear bomb that U.S. forces dropped on the Japanese city of Hiroshima on August 6th, 1945, leveled a two-mile radius of the city, killing an estimated 80,000 people. It was an enormous amount of destruction—and it was caused by less than two percent of the uranium carried by the bomb. You can fry an egg over a C12H14 flame or a C14H24 flame and get pretty much the same fried egg either way, but the kitchen will be affected by which fuel you use. p1t1o wrote: The short answer is - yes, a large amount of energy (no matter the form) dumped into a small volume of air will indeed resemble a nuclear explosion. I figured that you'd get something similar to a nuclear explosion, minus the fallout, but would a smaller percentage of that be shed as a shockwave because we don't have solid mass to vaporize? Or is that contribution negligible? The mass of air superheated by the release of energy will vastly dwarf the mass of any functional nuclear bomb. At sea level, each cubic meter of air affected equals about a kilogram and a half, so six thousand cubic meters or so (i.e. a sphere about ten meters in radius) will outmass any but the largest nuclear devices, and any but the smallest nukes is going to have a fireball in the hundreds of meters in radius. I suspect the part about it being "a few hundred metres above the ground" would be very significant. Super-heating the rock, sand, mud or water below it ought to have different results from superheating air. If nothing else, lower detonation altitude height would make for dirtier, more visible mushroom clouds. Unless the bang was hot enough to boil nucleii apart, though, I don't see them becoming radioactive fallout. They'd just be dust. High-altitude burst: 1km away, you'll hear it. Ground-strike: 1km away, windows will shatter. Shields will be splintered. Spears will be shaken. Haha, no, the contribution of the mass of a nuclear weapon is negligible. With say, a megaton energy release, within milliseconds many thousands of tons of atmosphere are involved. An extra couple hundred kilos of vaporised metal wont make much difference. The patterning on the fireball is caused by the vaporised weapon components. 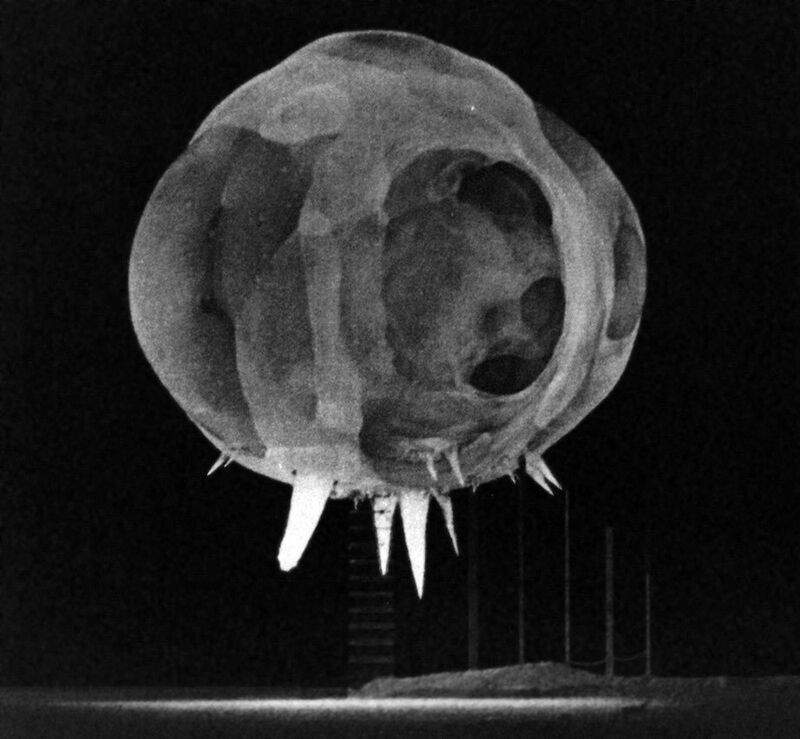 If nothing else, lower detonation altitude height would make for dirtier, more visible mushroom clouds. Unless the bang was hot enough to boil nucleii apart, though, I don't see them becoming radioactive fallout. They'd just be dust. It's true that the soil does not itself become radioactive, but it is indirectly the cause of fallout. A surface blast vaporizes the soil below. At higher altitude, the gas column condenses again, and falls out as dust. The trouble is that part of the fission products of the bomb are mixed in, and get trapped in the condensed dust particles. In an air blast (that doesn't touch the ground), the air column with fission products just keeps rising and rising, and the fission products are spread by stratospheric winds over the entire earth surface. That's too diluted to be a serious health risk, at least for individual bombs. This is why Hiroshima and Nagasaki were safe to live in directly after the war. So the problem of a low-altitude blast is that the fallout keeps the fission products concentrated in a small region, and radiation levels stay high enough to mutate chameleons to deathclaws.